VALLE DE GUADALUPE, BAJA CALIFORNIA - In the 1990's and much of the 2000's, your Gringo loved nothing more than a day spent with family and/or friends just south of the border in Baja California. The drive from San Diego was quick and transporting. 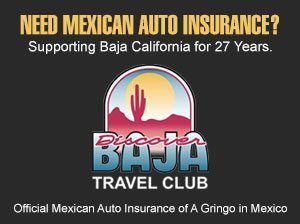 Within an hour, we could purchase our daily Mexican car insurance from one of the many stands in San Ysidro and roll to a family-owned restaurant in Puerto Nuevo to dine on inexpensive lobster lunches — complete with homemade tortillas, cervezas and BOGO margaritas. Or we could shop along Avenida Revolución in Tijuana, or snack on fish tacos on the malecon in Ensenada, or enjoy Sunday brunch at La Fonda Hotel in La Mision atop a high, rocky sea cliff overlooking the vast, tranquil Pacific. It was a quick Mexican fix with little effort. The view from the patio. L.A. Cetto, Valle de Guadalupe. The birth of our son in 2008 put a temporary halt to our travels due south and we were overdue for a trip to neighboring Baja California. Our 15th wedding anniversary was approaching in July 2012, so we took the opportunity to get back to some of our former stomping grounds. 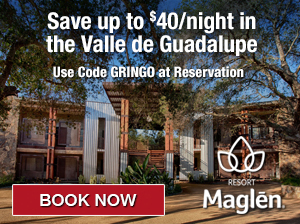 The Las Rocas Resort (an old favorite of ours) was offering a special in an attempt to lure visitors back that we just couldn’t pass up…$250 for 2 nights in an ocean view room, a lobster feast in Puerto Nuevo, and a full day of touring around Ensenada’s wine country, the Valle de Guadalupe. Welcome to the Las Rocas Resort, Rosarito Beach. The Las Rocas Resort is right off the Toll Road across the street from Giant Jesus. When we arrived, Las Rocas hadn’t changed too much in the five years since we last visited. The grounds perhaps were a touch more unruly, and one of the two jacuzzis was shut off and blockaded, but the staff were still friendly, the view of the Pacific Ocean from our balcony amazing and we settled quickly into our typical Baja state of easy relaxation. Tequila y Cerveza, at Las Rocas Resort. Our Valle de Guadalupe winery tour guide Ferndando arrived promptly the next morning at 10AM in front of Las Rocas to pick us up, along with our fellow guests — a family of self-proclaimed “Chilangos” (Mexicans who live in Mexico City, or “El De-effe” as I knowingly and amusingly intoned to them). The family consisted of three sisters and their husbands, including “Pepe Bimbo”, a very affable guy who is an executive at the multinational Bimbo food empire based in Mexico, thus earning his nickname. Visitors from Mexico City, as well as other populated Mexican mainland areas, seem to be filling the Baja tourism gap that we in the US left over the past decade. Fernando stated that his tours used to be 80% US and 20% Mexican visitors, but now has flipped to 80% Mexican and 20% US. We were happy to be part of the 20%. Hangin’ with Pepe Bimbo at the L.A. Cetto Winery, Guadalupe Valley. We’ve had Valle de Guadalupe wines all over Mexico in the past. The region supplies most of Mexico’s wine as well as exports to other countries, the US being a noted exclusion due to high tariffs attached to importing. I’d made a brief stopover with friends on the way back from San Felipe at Viña de Liceaga earlier in the year, and Fernando’s tour would take us to three very different wineries: Baron Balche, a very small boutique winery complete with a tasting cave, L.A. Cetto, Mexico’s largest wine producer and the largest vineyard in Valle de Guadalupe, and La Hacienda Restaurant and Winery, a beautiful spot with historic structures, sprawling gardens and an array of unusual fruit-forward wines (mango, guava, etc.). The area was established as a wine and agricultural region after an unsuccessful founding of the valley by Jesuit missionaries from 1834-1836 (they were chased out and their mission destroyed by local indigenous tribes). In 1905, 105 Russian families fleeing religious persecution in czarist Russia purchased 13,000 acres from the Mexican government and began growing grapes and wheat as well as keeping bees and raising geese. In 1938, Mexican president Cardenas seized all foreign-owned lands, including that owned by the Russians. Ultimately, Mexican “squatters” moved in to take over the valley and it’s vineyards, which are owned largely by Mexican interests to this day. Of the original 105 families only 4 of pure Russian lineage remain and some of their original Russian-style homes still stand. Our first stop was at one of these Russian homes, which has been turned into a Museum, restaurant and bakery. We enjoyed goat empenadas, fresh-baked bread (Pan Ruso), honey and cheese and toured the small home which houses the actual artifacts, tools and artwork used by one of the early Russian settler families. Eerily, one of the young Russian girls in the restaurant bore a STRIKING resemblance to a painting of an early settler in the museum. We found out that she was the great, great granddaughter of the woman in the painting. Russian Museum. We met this woman’s great, great granddaughter. Russian Museum, Valle de Guadalupe. Pan Ruso, Guadalupe Valley, Baja California. Our first winery was Baron Balche, a small, boutique winery. We winded up a dirt road in the conversion van and were greeted lazily (in a great way) by several elderly gentlemen enjoying a glass of afternoon wine in the shade of the vineyard’s front porch. We proceeded into the winery and down a flight of stairs to the subterranean wine cave…which houses the vineyard’s barrels as well as their tasting room. Sampling several excellent wines, Fernando had let me know that one of their bottles was $150, their top of the line. Winking, he conspiratorially handed me a glass of said wine as the owner passed him another. It’s good to have connections. Salud Fernando! Baron Balche’s wine cork sign, Valle de Guadalupe. Our next stop was L.A. Cetto, Mexico’s largest wine-producing vineyard. After conferring with a few of the gate guards, Fernando was waved through the parking lot to a long dusty road that led straight up the vineyard hillside to a custom bullfighting ring and huge (concert-size) entertainment patio. The view from the patio was amazing, affording a vista of the entire Valle de Guadalupe to the south. We drove back to the main visitor’s area, parked and were led on a path that winded beneath a large and amazing arbor overflowing with vines and ripening grapes above our heads to the vineyard’s vast tasting room. Dozens of mostly Mexican families and visitors were enjoying this sunny Saturday at L.A. Cetto. Hundreds of bottles of wine ranging from very inexpensive to premium line the walls, and tasters stand casually around small tables as they are poured samples from one of L.A. Cetto’s myriad, friendly and helpful staff. An overhead arbor awash in vines and grapes, L.A. Cetto Vineyard. Ursula enjoys a glass at the L.A. Cetto Vineyard. We ended the day at the La Hacienda Restaurant and Winery, where after enjoying their fruity mango, guava and pomegranate wines, we wandered around the sprawling property through lush gardens scattered with amazing artwork, crumbling statuary and bird cages. We thanked the friendly owners and staff and headed back to Las Rocas and our lobster feast in Puerto Nuevo (amazing, BTW. Although the lobster is not typically from the region now, we were served two each with full sides of tortillas, rice and beans with a Pacific view). The fruity wines at La Hacienda. Part of La Hacienda’s sprawling grounds. Las Rocas is still running the $250 deal at last check and your Gringo plans on returning with more of his family soon. You should too! Popotla…Feeding My Mariscos Madness. Again. Fantastic piece! That Pinot Noir I bought at L.A. Cetto on our way back from San Felipe was amazing. Fantastic hospitality too. Jealous of your deep dive in the valley! Just found you as I research where to retire/refire from high cost of living in southern CA. yet still be close to work & children & grandchildren…Everyone thinks we are poco loco to look into the real Mexican small town (Tecate) area so it was good to find some encouraging voices. Read Catherine Stribling’s quick visit to the wine region via Tecate, then was happy to find your work. Appreciating & enjoying your passion for the area. Thanks for your insights which are so helpful as we plan our own exploratory trip from Tecate through the Ruta de Vino. Personally, I could visualize living in Tecate. It is small, friendly, clean, and has some great food from the street on up to the top of the hill at Asao. And did I mention they make a great beer? Thanks again and let me know if you end up landing in Tecate…sounds like a GREAT adventure and I don’t think you’re poco loco at all! Gracias Caliyat! I think you will enjoy Las Rocas, as well as the wine tour. If your driver/tour guide is Fernando, please tell him A Gringo In Mexico says “HOLA!”. I’m curious how much your wine tour guide, Fernando, costs for the day? I imagine it’s a per person rate? How did you get in touch with him? Thanks in advance! Fernando’s tour was part of a $250/total package at Las Rocas Hotel that also included two nights lodging and a Lobster Dinner in Puerto Nuevo (GREAT deal. They may still have it going on). I did contact Fernando on a separate occasion regarding a private tour for which he quoted $45/person, which seemed like an amazing price given his connections throughout the Valle de Guadalupe. If you want to get in touch with him, his email address is: fernando.toursinbaja@gmail.com. If you hook up with him, please tell him A Gringo In Mexico said “HOLA!”. Thanks for the reply. $250 for 2 nights, lobster dinner AND wine tour is an amazing deal! I’ll definitely have to look into it. Thanks again. I thoroughly enjoyed your article on the Las Rochas tour and the Russians in Baja. The museum and photographs are amazing. They may be Russians, but they are women and they did the laundry and the baking and they still do! I am from the wine country of northern Callifornia, settling in San Diego. The Russians came to settle up north from Siberia also. So there are many similarities–proves we are all human and share the same humanity. What a colorful history! Thank you! I assume you have to have a US passport to go on the tour?